Welcome message... Welcome to specialized instruction. I believe communication between parent and teacher is the key to a successful student. It is a joy to be your child's teacher this year. I am excited about this school year. I hope you are too. Feel free to contact me. I will be teaching the specialized support subjects this year, Math, Reading, Writing, Social Studies, Science, and Employability. We have high expectations for each student. Each student will be taught at their level using informal testing and IEP goals. Data documentation of IEP goals will be taken at least one time a week. We will be using a variety of curriculum such as Unique, News-2-You, Vizzle, RAZkids, and teacher created materials. This will be an exciting year filled with fun and new learning experiences. We will have a student teacher who will also help us add new ideas and experiences. Our paraprofessional this year will be Mr. Cesar Hernandez. About me... I have a masters degree in special education from Texas State University. 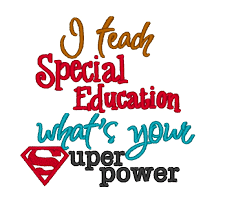 I have been a special educator for 26 years in various aspects of special education. I have taught specialized instruction here at Stinson for the last 11 years. I have found my little piece of heaven here as a Skyhawk. I love my students just like they were my own children. They are a true blessing in my life. I love coming to work everyday!